If you are interested in partnering with me on a promotional opportunity, please contact me tinyhousegiantjourney@gmail.com and visit my partnerships page for more information. If you have a question, please read the following points before making contact. I receive an overwhelming amount of email and, although I’d love to hear from all of you, I simply don’t have time to answer everyone. If I did that, I’d never be able to produce new content for this blog! The links below will answer 99% of your questions immediately. Thank you for understanding and taking the time to search this blog for your answer before contacting me. Where can I see your Tiny House? Unfortunately, I can’t show the house on an individual basis. If I am having an open house, it will be announced on my facebook page. In the meantime, watch my video tour, view my gallery, and follow me on Instagram. You can also now book my house on AirBNB when I’m not using it. What is a Tiny House? How much does it cost? Materials list? I have outlined the true costs of building a Tiny House in this article. I also have a materials list page and a FAQ page with these answers and more. 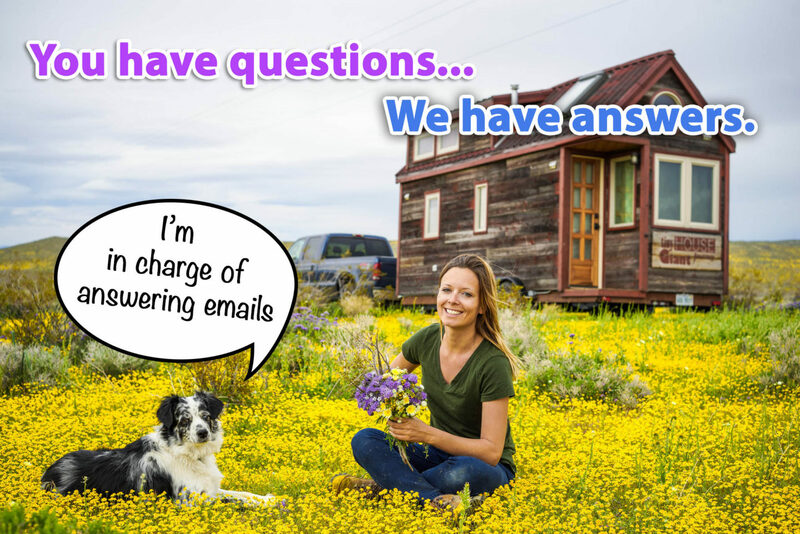 My resources page is also full of information on Tiny House living and Travel. I’m constantly updating it, so it’s the best place to find new info. I wrote a detailed blog post about Tiny House Parking. This blog and my social media channels make some money from advertising, promotional partnerships and affiliate marketing, as disclosed here. If you’d like to work with me on promoting a product or service, please visit my partnerships page. As of 2018, I dedicated 100% of my time to creating content for Tiny House Giant Journey. Please note I only promote products that I use and/or truly believe will be helpful and appropriate for my followers. You can help support my blog by liking, sharing, and commenting on my posts. You can also sign up for my newsletter and follow me on social media. If you’d like to go one step further, you can support my video blogging on Patreon for just a few dollars a month. Thank you! I do not accept guest posts. That being said, I do love hearing about other people going tiny and, if possible, I’d love to visit your tiny house! Please share your story in the Visitor Posts section of my Facebook page. Can you bring your house to our event? No, sorry. At the moment, I am permanently parked and cannot move the Tiny House. I can, however, bring my renovated vintage camper to events. Please contact me at tinyhousegiantjoureny@gmail.com if you’d like to book my camper at an event. I have been featured on TV shows several times, on multiple networks. Contact me at tinyhousegiantjourney@gmail.com with details please. Try using the search field in the top right corner of your screen to see if I’ve written an article that answers your question. I have written hundreds of articles on alternative lifestyle and travel. There’s a good chance your answer is on this blog. Please respond to the below. I am writing a book that will help others but are really my devout notes on refinishing my 1962 American Coach 8 x 50 (about 500 sq ft into something far more usable by opening most of it up, and doing a complete gut job with reclaimed materials in a cold area of the USA. After that I will likely try to put together a tiny home/RV community on an RV campground for sale in a warm area. This book (one of four) will be the beginning. On many topics other books do not touch. I can tell you more via email — that is how I conduct interviews and hopefully you will know more people I can interview. I am writing a book on tiny home communities build from RV parks being sold off. I am pushing for each book to have 14 chapters, pictures and floor plans. A bio area, forward, conclusion etc., you may know every vendor possible who has the head knowledge and ability to add a place, idea, suppliers, etc to my book. Architects and builders that have new and innovated tiny home/community trailers on wheels are of utmost importance to me. Especially if they use reclaimed beautiful artifacts, wood, etc. Each person who adds to a chapter is placed in the same bio area in the back of the book and I will have a supplier section as well so people can dig by themselves. Vehicles within each community are like golf carts while big vehicles are kept in a parking lot just outside the internal community, or vespa like scooters, a electric smart car, best motorcycle, and best regular pedal/electric bike you can petal into town with baskets for food, etc If I choose your piece I will work it into my book and for recompense there will be a large bio area in the back of the book with picture, and all the info on you and what you sell for RV/Tiny home communities. I want to talk to the up and coming builders/architecture people, I’d like to print some of their plans and why they are adding what they are adding now. I consider tiny to be from about 350 sq ft to 800 sq ft and much smaller if they want. Again based on a community here and what you can buy that has most of the components there and ready to use. From tiny homes (my main topic) to the beginnings such as my 1962 10 x 50 American Coach, learning to live with lots left, decorating and renovating with treasures from the past. Please PM me back for more info (I have tons), more questions/topics, what can be sold in a community store., etc. or…whatever interests you. Remember each book will build upon the first. I want to help you but I am homeless, just won a settlement and trying to find ppl who can direct me on how to build a 1 room house for $13,000. I’m thinking of buying one of those sheds for $5,000, it couple windows, insulate, run plumbing, electric.. No idea where or how to start. At 47, this is it for life for me and only chance at stability. My monthly payment would cover rent for land but idk where to go for that either. If you know anyone who has expertise and knowledge please help me! Good luck with your book. you have a good job. Keep work! I very love you! It was a pleasure to meet you and help you at REI Olympia today. Your journey is amazing. I would have loved to meet your dog today, you should have brought him in the store. We allow that sort of thing. Haha, well we might very well come back. Thank you so much for helping us out pick our gear, we already love it!